This article was written on 15 May 2018, and is filled under Past Exhibitions. The gallery will be open to everyone after commencement on May 19 from 1-4 pm. Students graduating from the Department of Art and Design present their creative work in this group show. 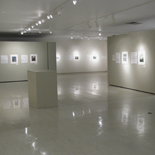 The exhibit typically feature works in all fine arts media including painting, drawing, printmaking, book arts, sculpture, metals, ceramics, graphic design and computer assisted design. Students in this exhibition are fulfilling the requirements of their degrees, either Bachelor of Arts or Bachelor of Science Education. Senior students participating in the exhibit are: Khendell Bessel, Emily Curley, Rachel Dyson-Hrpcek,Jacob Fischer, Lexi Heiser, Kristen Humphrey, Courtney Huschka, Kelly Jacob, Alyssa Johnson, Halie Johnson, Allie Karnowski, Rachel Klemp, Corinne Maddix, Jessica Nannemann, Carmen Rick, Maria A. Rodriguez, Jordyn Schmidt, Lauren Skolak, Allison Timmins, Anna Tracy, Kirsten Tyrrell, Kira Weir and Rachel White.